We’ve all been there, the current job isn’t quite fulfilling you or getting you where you want to be, but you’d rather not annoy your current employer by rubbing their nose in the fact that you’re seeing what else is out there. So what can you do? Well, Makeshift, which describes itself as “a new kind of startup studio” based in London, has today launched Hire My Friend to “give a leg up to the little guy”. Essentially, the company wants full-time employees to be able to find new jobs as easily as freelancers, but without getting sacked in the process. While recruitment agencies and services are ten a penny (or, more likely, a dime a dozen if you’re in the US) Hire My Friend promises to be a more direct, targeted – and crucially, discreet – service. 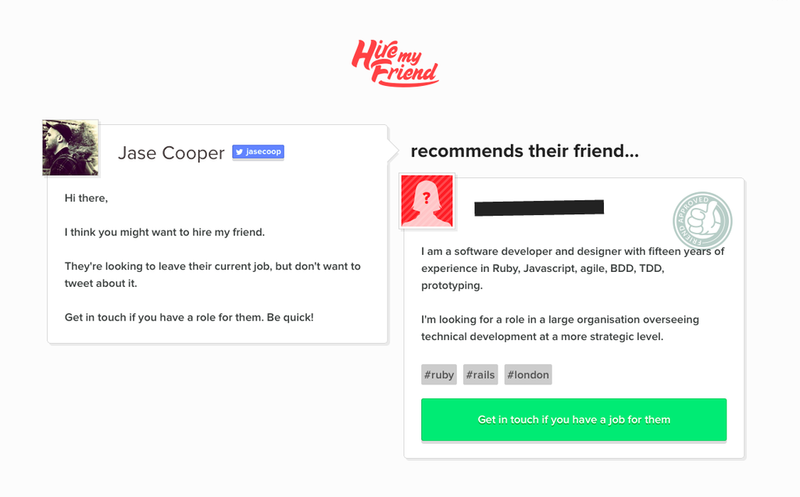 While there are plenty of job boards, from behemoths like Monster.com to newsletters like Escape the City and professional social networks like Linkedin, Hire My Friend is a social, targeted and local platform for job searches made for the people of the Internet. With this new product, Makeshift aims to knock out pesky recruiters and make hiring in the startup scene more efficient. To start, Hire My Friend has partnered with companies such as Editd, MixCloud, Fueled, Huge, Tray.io, YPlan, Sidekick Studios, and GoCardless. 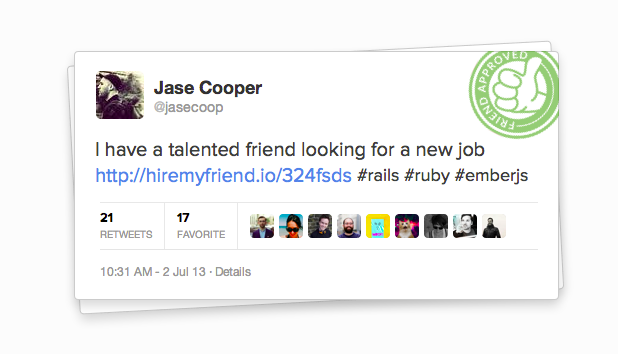 In this instance, partnered means the companies are actively searching for employees using Hire My Friend. Users simply sign up and create a profile page (which is then anonymized by blurring out faces and names), fill out as vague or descriptive details about their skills as they like and select three hashtags that will get tweeted when their friend recommends them. Then they simply send out their anonymous profile get their friend to send out their profile on their behalf. The image below is what you see if you click the tweeted link. Interested potential employers can then choose to get in touch and the potential employee receives an email notification. They then have to choose whether they want to find out more and reveal their identity or, well, not. The service’s success will likely live or die on its ability to attract enough companies to use it to fill vacancies – it’s all very well having people tweet profiles there’s little point to it, or money in it. Initially, the service is free to everyone, but the company says it plans to introduce a small fee (somewhere around £10) for employers “to reach talented hires”. While it’s going up against behemoths with heritage, it’s doing it in a way that integrates social media (an increasingly used tool by recruiters) in a more than cursory way but allows users to retain a sense of control over who sees their information, which in an increasingly privacy-conscious age can only be a good thing.